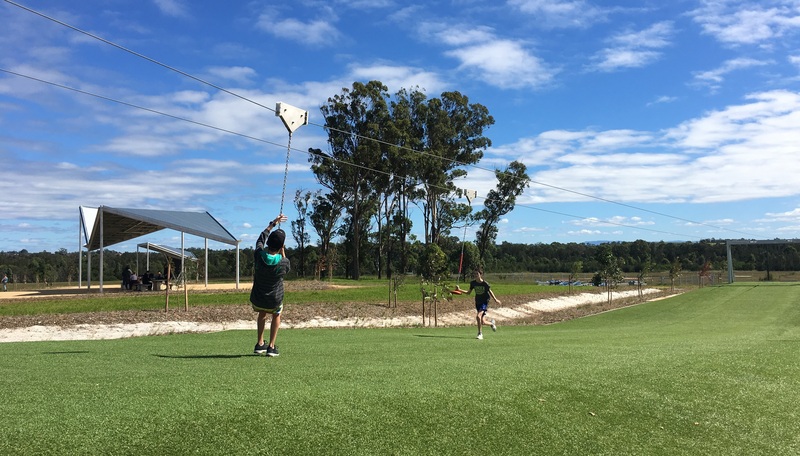 Western Sydney Parklands, stretching from Blacktown in the north to Liverpool in the south, provides a vital green corridor of land for the recreation, health and wellbeing of the people of western Sydney. It is interesting to learn that the parklands cover an area of 5,280 hectares, making it the largest urban parkland system in Australia and one of the largest in the world. 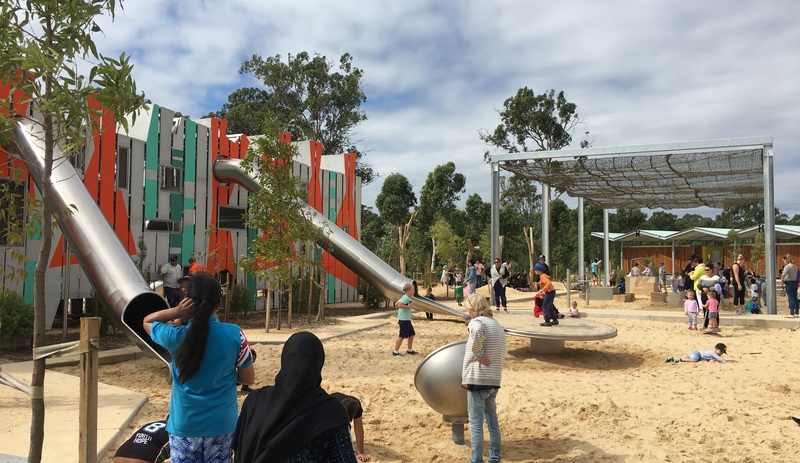 The newest park to open in Western Sydney Parklands is Bungarribee Park located in Doonside. Bungarribee, which can be loosely translated as "creek with cockatoos", is the name given to this area by traditional owners of the land, the Daruk people. Bungarribee Park, which opened to the public at the end of March 2017, comprises around 200 hectares of land which has been set aside for recreational and environmental purposes. The park will play an important role environmentally in terms of revegetation and the protection of wetlands around Bungarribee and Eastern creeks. In this project, 20 hectares of native wildflower and thousands of native trees will be planted to restore the Cumberland Plain. 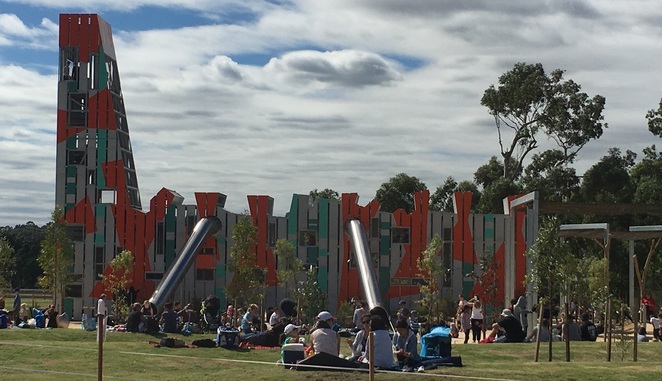 The entrance to the park is at the intersection of Holbeche and Doonside Roads, Bungarribee. There is a large car park adjacent to the playground area. 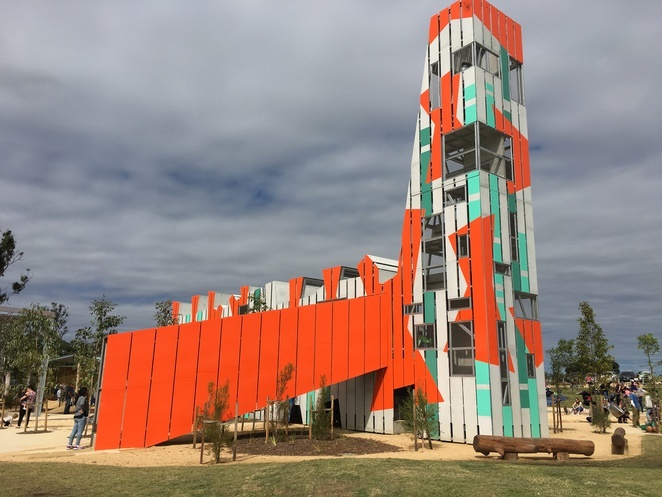 The first thing you will notice is the towering climbing structure and its bright geometric design. The large metal structure reminds me of a weird and wonderful spaceship or a make-believe animal created by a young child with their Lego. At one end of the structure is a tower which is 14 metres high and across the mid-section are slides and exits to the outside. When you enter the structure you will find large metal steps leading you up to the different levels, but be careful with small children as they may have trouble climbing up them. In some sections, there are ropes hanging from the ceiling to help you climb. In the middle of the structure, you come to the slides (two on each side) which will bring you sliding outside into the sand. There is also a ramp for those who don't want to slide or climb back down. In the tower, there are windows to look out on and wave to Mum or Dad below. Surrounding the climbing structure are a number of different areas featuring a variety of playground equipment. One of the biggest attractions is a large sand and water play section. For those worried about dirty clothes or wet shoes, it's probably a good idea to bring an extra set as getting dirty is part of the fun here. The park also features an area with traditional swings and a cool log swing made out of rope. One of the things I liked most about this park was the natural setting. 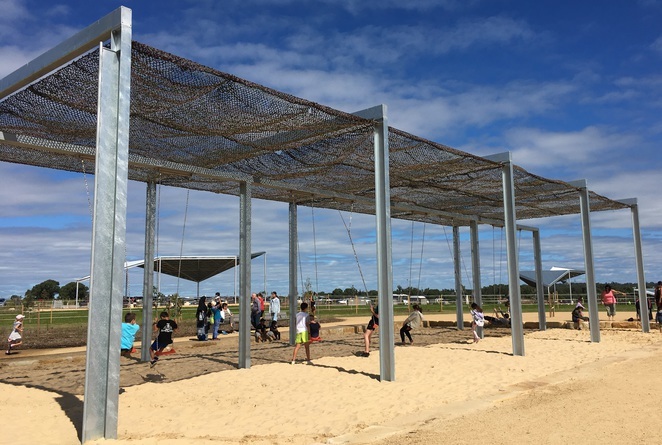 The playground is not surrounded by traditional soft fall material but instead relies on sand and mulch which gives it a bushland feel. There are also areas where kids can play in the dirt and sand, amongst trees and logs. 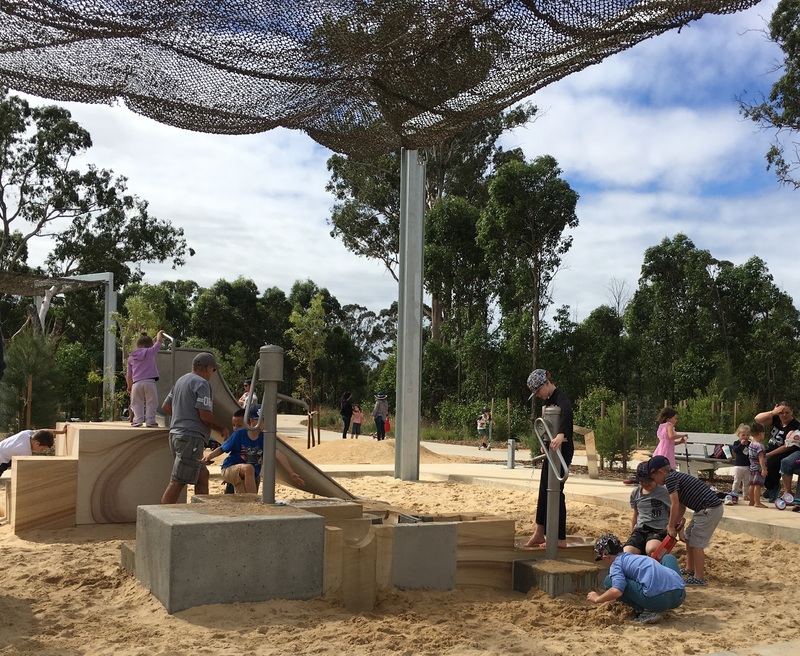 For parents and carers, there are bench seats and plenty of logs to sit on or there is a nice landscaped grassed area right near the playground where you can sit and keep an eye on the kids. While some of the play areas are covered with loose netting there is not a lot of sun protection at this park (apart from the picnic shelters), so hats and sunscreen are a must. Right near the playground is a large amenities block which includes around 12 toilets and hand washing facilities. It is also great to see that bubblers have been installed. Just a short walk from the climbing structure you will find another large set of swings and a twin flying fox which travels for around 50 metres and is a great attraction for older children. 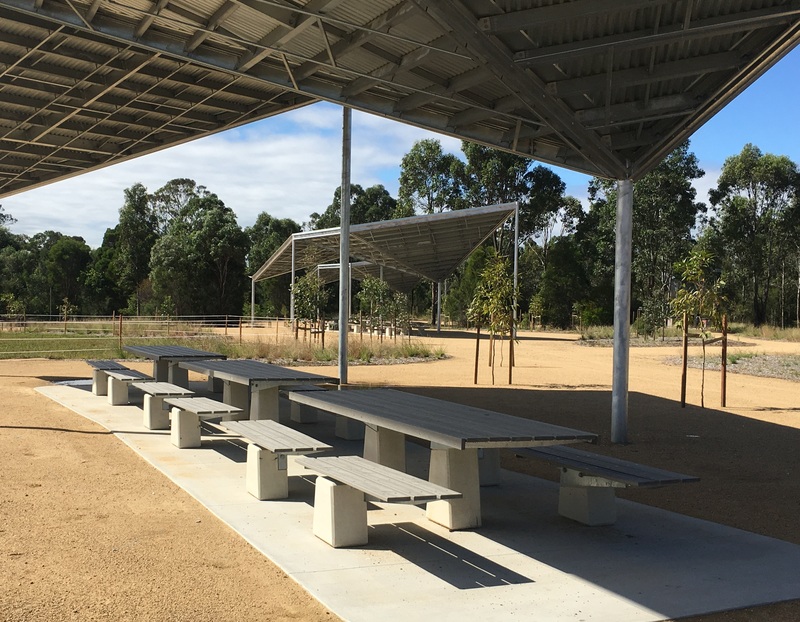 In addition to the play areas Bungarribee Park features 20 barbecues, 13 large picnic shelters, sealed walking and cycling tracks and an off-leash dog park named Warrigal Run. Young children will love the climbing tower and water play at this park, whereas older kids will enjoy the flying foxes, cycleways and open grassed areas. The picnic facilities, BBQs and shelters will be a big drawcard for families. As the park is newly opened a lot of the grassed areas are still fenced off so that the new grass can be established. However, in future, there will be plenty of grassed areas to enjoy. It is important to note there is no café or food outlets on site so BYO food and drinks. Bubblers are provided for drinking water. It was great to see that on the day we visited, in the April school holidays, the park was already being very well used by families. Bungarribee Park has been provided by the NSW government with a total investment of $15 million. To view a map of the park please click here. Other areas to visit in Western Sydney Parklands include Plough and Harrow, Lizard Log, The Dairy, Nurragingy Reserve and Wylde MTB Trail. Western Sydney Parklands are open from 8am - 5pm from May - July. From August until April opening hours are extended from 8am - 7pm. For more information about visiting Western Sydney Parklands please click here. Playgrounds have come a log way since I was young. I particularly like the number of swings available in this one so all the kids get a go. Seriously this is the worst park we've been too. I'm calling this a "painpark". My child and I hit our head multiple times inside the big metal structure. That is poorly designed and built. Its the metal beams that get you. No-one thought to cover them in something like rubber or something. The surfaces are also very slippery inside on the flat sloping metal. Keep in mind this is next to the sand/water area and kids climb up with there wet shoes. Nearly broke an arm on that. Never had any issue whatsoever at Sydney Olympic Park. The small holes/entrances and wet sand ensures that its impossible to watch your child and not end up filthy. Sydney Olympic Par use rubber floors to largely solve this. I glossed over the sand/water area. In this there are some taps and sand all in the one place. With a number of kids and a limited number of taps, be prepared to watch your kids in that area for the fights that will occur over who gets to play with the limited number of taps. 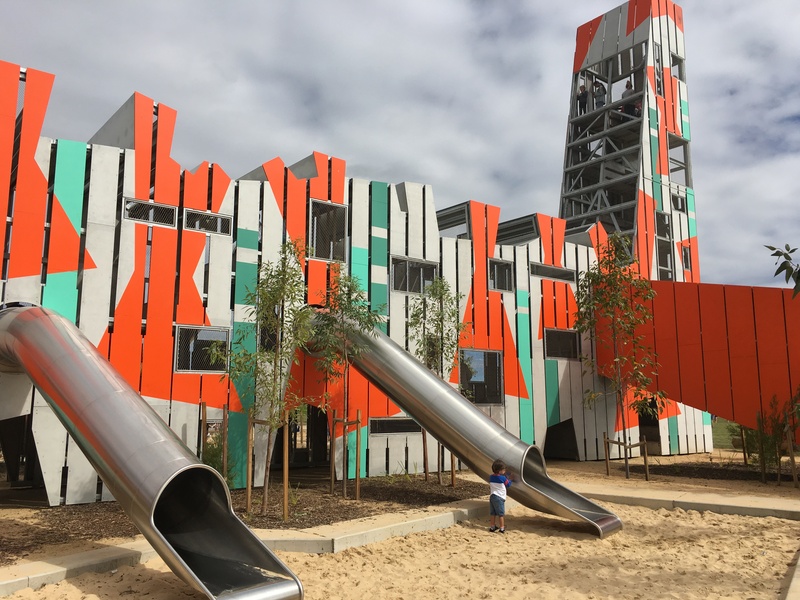 Again Sydney Olympic Park have these separate so the whole place doesn't get messy..... An they also have no controls on the water area so all the kids can just run about. Parking is another disaster area. The car park is tiny given its supposed status as one of the big parks. Perhaps even the designers of this place had little confidence anyone would show up after a while. An I hate to think what will happen in the middle of summer with a tall exposed and enclosed metal structure. Odds are it will have to closed down for months for OH&S reasons. In summery everything that Sydney Olympic park got right, this one got wrong. After we left this "park" we went to a local Bunnings and played there. I can honesty say my kid had a better time there.